One thing that we can always do, and I highly recommend it, is investing in good quality locks and doors. There are certain things we need to check around the doorway itself. First of all, we want to make sure that any door we have on the outside is a solid-core door versus a hollow door. Most reputable builders are going to put a solid core door on the house itself. Unfortunately, we don't always invest in the best locks and hardware. There are some specific things that we want to think about when placing outside doors. First is where the door closes. This door has both a normal door catch and it also has a single cylinder deadbolt. So when the door's closed, we're actually making contact with the door frame in two places. This is the normal part, the regular doorknob, and this would be where the deadbolt is. There are a couple of important things to think about. Generally the screws that hold these strip plates into the door frame come with the plate itself. They're only about an inch long. If you use these screws, then it's very easy for an intruder to kick in the door with enough force to break out part of the frame. These screws actually need to be four inches or greater so that they go not just through the 1x4 frame of the door itself, but all the way into the 2x4 structure. Now you've attached it to much stronger place to secure the door. Another thing to look at are the screws in the main hinges that hold the door. Let's go back to the idea of using screws that are 4 to 6 to 8 inches in length. In this case, there are four hinges in this door frame, so we would want to put at least half of those screws at that 4 to 6 to 8 inch length versus that short 1 1/2, 2 inch screw. We want to get past the door frame itself and into the heavy construction framework of the doorway itself. 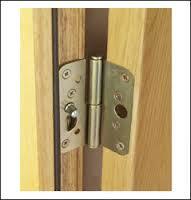 Another thing you can look for on your door frame is your door hinge itself. When looking at the hinge, reach in the side and see if the plate is flat. If that plate in the center of the hinge is flat, it doesn't offer as much protection as some other hinges that will actually have a small pin and a hole on the opposite side so that when the door is closed that pin actually goes into the hole. It makes that hinge itself more stable and it also makes it harder to get the door out of the framework itself. Another thing that we want to talk about is your deadbolt. We want to make sure that the home builder has put a deep enough hole in the side of the door frame to accommodate the throw of the deadbolt. We also want to make sure that the deadbolt will go all the way into the door frame without hitting the bottom or bottoming out in the door frame hole. So a good way to do it is extend the deadbolt, find something, measure it. So, this is how far that deadbolt is going to go, I should be able to get all the way into the stripe plate with no problem without hitting the back. If you actually notice, the depth of the striped plate hole is actually greater than than the throw of the deadbolt by at least about an 1/8th or 1/4 inch. So this is really a well set up deadbolt.